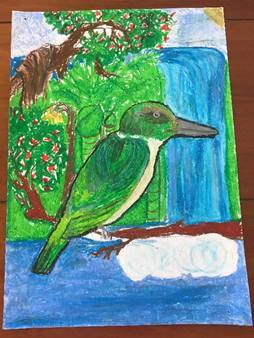 “This Kotare / Kingfisher is sitting in front of a stand of Aotea’s native trees and waterfall. A strong sturdy little bird with purpose,” Stevie Mabey, winner of the Easter Arts Competition. Runners up were Terri Hunsdale, Peter Scott and Maysie Currie. Kotare are found widely in New Zealand and on Great Barrier. You will find them excavating nests in banks or trees in open habitats where it is easy to find prey to feed their young. 1st prize in the Easter art competition. Terri Hunsdale, Peter Scott & Maisey Currie were other winners. 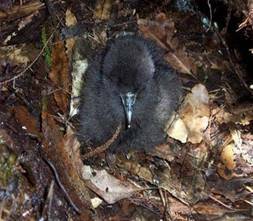 Late last year Predator Free NZ 2050 gave the Environmental Trust a generous grant towards traps and trap boxes. These have been very popular with locals who were already doing pest management and have also prompted several groups to initiate projects. Feed-back from most recipients has been enthusiastic. Plenty of ship rats trapped in March, April and well into May. The general response has been a surprise at the numbers caught and a desire to extend their trap lines. However, this is a general pattern for these months. Several reports of more mice being caught will suggest rat density has dropped. On Friday we saw a takoketai, on our deck. There was a massive storm, we could hardly hold the door open. It was really windy. The takoketai ran along the deck and tried to take off. The wind flipped him back and he flipped himself forward. Dad put some gloves on and tried to catch it to help. It ran into the shed, there was a rat trap in the shed “oh no”. Dad kicked the rat trap so the takoketai didn’t get caught. He finally caught the takoketai and threw it into the air. It crashed, then it tucked in its wings and looked back for Dad to pick it up again, it was the takoketais last chance. Dad picked it up and threw it up high up into the air and opened its huge wings and “woosh” it was gone. Zephyr 9 years. Below is the latest map showing where our black petrel fledglings are at the moment. Three birds have now crossed the Equator into the Northern Hemisphere, and one bird is only about 80 km SE of Floreana Island, in the Galapagos Islands. The total distance travelled by these birds is now 146,655 km, averaging out to 10,475 km per bird. One more device has stopped working since the last update, so there are now three "X"s on the map showing the last known locations of these birds (Figure 1). Figure 1: Total distance travelled by takoketai (black petrels), who travelled as far as the Galapagos Islands. Okiwi School children and staff have looked after Okiwi Reserve for many years. Their work has included pest control, native plantings, making weta homes and more. The children have a pride and sense of kaitiaki for the park and its surrounds. 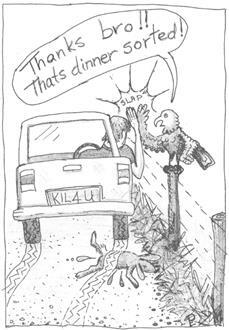 People in Okiwi take pride in the bird life of our valley. The Great Barrier Local Board are supporting the Okiwi Community Pest Project, which aims to protect and enhance biodiversity values in Okiwi, support existing initiatives, and raise awareness and understanding of biodiversity values, threats, and their management. 200 kill rat traps in wooden boxes have been placed throughout approx. 50ha in Okiwi and ten A24 multi kill traps have been supplied by DOC and will be trialed. As of February 2018 a group of keen conservationists have been meeting every month to discuss biodiversity, learn from each other and give updates on ecology projects that are guided by the Aotea ecology vision, published in November 2016. Since February Shanti Morgan, the island’s biodiversity advisor has been organising the monthly catch ups. Highlights of the meetings include a guest speaker from Gecko consultants who informed the group on options for community governance. A presentation on funding options for projects and an overview of successful community conservation groups across New Zealand. Attendees have worked together at meetings to form project proposals which may be established in 2018. These projects follow the principles outlined in the ecology vision such as the sustained control of introduced predators, planting trees for stream health, food for birds and connecting the community to the whenua in ways in which residents can get together and enjoy the restoration results. Four projects have arisen with themes of widespread feral cat control in the north, an eco-hub in the Medlands-Kaitoke area, a mountain to sea education project focused in Tryphena and a southern sanctuary initiative … could we work collaboratively to eliminate rats in our most populous townships? With so much going on for ecology groups on Aotea, the vision meetings present an opportunity to get together, share problems and successes, and to give advice around ecological issues. The meetings will continue to be held on the last Sunday of each month and are open to all those interested in ecology. Kohekohe (Dysoxylum spectabile) is a beautiful forest tree growing up to 15 metres or more. It is a close relative of the Mahogany family. It has large glossy leaves, being 4 pairs of leaflets and ending in a single terminal leaf. blooming in the early winter. Kohekohe flowers bi-annually, as the fruit takes 15 months to ripen. So on the years it flowers you will not find fruit on that same tree. The fruit is about the size of a walnut and when ripe the hard capsule opens slowly exposing a bright red covering of the seeds inside. Kohekohe is an important nectar food source for Tui and other bush birds. Kohekohe was also well known and used in Maori medicines. The bark and leaves are used for tonics when boiled. Poultices and washes for various ailments as well. In earlier time a brave man was likened to the Kohekohe canoe, which was swift and strong. Earlier this year, we ‘farewelled’ Emmy Pratt after 10 years as a trustee. John Ogden recalls Emmy’s significant contribution over this time. Emmy didn’t say much at meetings, but that is not to say she didn’t contribute much, because she did. And, she always came despite many other commitments. She always thought about how our plans and statements might be interpreted by the wider community. This connection with the Barrier grass-roots was her great contribution over the decade of her involvement, listening to our aspirations and making useful comments. Emmy always made us aware when she thought we were heading down the wrong path. Emmy’s great strength was in matters practical. She was always happy to help – on a stall, checking rat traps on Hirakimata , reporting , or collating items for the Bush Telegraph. However, this is not an obituary! Emmy is alive and well and will certainly continue her activities in the community where her commitment to the natural history of Great Barrier will quietly spread environmental awareness and plain common sense. The Trust has been privileged to have had Emmy Pratt as an active member for so long.